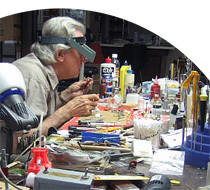 We specialize in Muramatsu flute repair. The national distributor for Muramatsu flutes, Muramatsu America is located only about 15 miles from us so, here in this area, there are plenty of Muramatsus to work on. To keep up with the latest innovations, we also go to Japan about every other year. There are always new things to learn at both the Muramatsu factory and at the repair shop in Shinjuku and it helps keep our repair skills up to date and precise. We also have lots of piccolo experience. We had the opportunity a few years back to sharpen our skills with the instrument doing work for Miles Zentner. He sent us newly made piccolos and we put in the 1st set of pads and completed any last finishing work. His piccolo has been discontinued for a number of years now but we still see plenty of piccolos .